I was wrong. There I said it. For the past 6 years, I’ve made fun of cork, and for that, I am wrong. I used to tell people that cork was dead. Cork was ancient technology meant only to ruin your wine. I ranted about the use of cork in wine of any kind. The reason was simple: TCA, or 2,4,6-trichloroanisole, a chemical that causes one’s wine to taste like dirty wet cardboard and bitter earth. I hate this substance and I mistakenly thought that there was no other way to have wine without it other than getting rid of its host, the cork. This is where I found myself most in the wrong. It was the 1st day of August that I arrived at this conclusion. Gabriella and I had the chance to visit Amorim,the largest cork producer in the world and to hear their side of the story. I was nervous at the time. Carlos de Jesus, the Director of Marketing Communications, was to pick us up and drive us around all day trying to show us that cork was not that bad. I was honestly terrified. How could I spend all day with the enemy, trying to stay amicable and not end up frothing at the mouth yelling with indignation at the insanity of stuffing a dead piece of tree bark into a pristine bottle of wine? Fortunately, and to the delight of all, it did not end up quite that bad. Carlos, it turns out, is a man who gained my respect very quickly. Passionate and intelligent, he walked the line between scholar and zealot, at moments almost crazed while at the same time incredibly well versed in this surprisingly emotional debate. In this way, the day began with us feeling out one another, while we drove to our first stop, one of Amorim’s cork factories. We started with the usual “where are you from” and “what do you do”. Nice and friendly, but we quickly found ourselves speaking at higher volumes as the world of cork versus screw cap pushed its way quickly into the conversation like a relative who no one really wanted at the reunion anyways. It happened so fast that I can’t really say how it came about, but there we were, me with my misconceptions and Carlos with a party line backed by what turned out to be good science. I know my stuff, or so I thought, but no matter how much personal pride is at stake, there is a powerful force that any rational person can’t deny. In this article, I’m not going to lay out all the facts and truths Carlos told us in an effort to change your minds. I’m writing this to make a point. If you are a member of my family, a close friend, or otherwise know me on a personal level, you know one thing for sure: I am stubborn and my convictions, for better or worse, are held firmly and close to my heart. I hope too, that with time, I’ve learned that knowing when to re-evaluate one’s beliefs is more important than blindly following them no matter what. I say this because I’m still trying to figure out how to argue against the use of cork. I really am. Like I said, this is not the article to lay out all of the ways that cork should be used or preferred to screwcaps or plastic corks. Instead, I want to give you the one reason I feel I can no longer advocate for the banishment of cork to the wine museums. Until 1998, nothing was actively done to fix cork taint. In fact, the industry even went so far as to deny it was a problem. It was around 1998 though that the cork industry “woke up”, as Carlos is wont to say, and began to take measures to fix it. Since that time, some of the cork companies have moved to make massive changes in hopes of cleaning up the problem, while other cork companies have rested on their laurels not really having done anything at all. Now imagine this. There are over 600 cork producers in Portugal alone! 600! Even if only one of these producers continues to put out faulty corks, the industry as a whole will continue to be blamed for the problem of TCA. Seems a bit unfair, especially if there are certain companies trying to remedy what it turns out is a very fixable problem. That maintains the quality of the wine by means of a absence of liquid leakage, a controlled regulation of the gas exchanges and an absence of TCA. First off, I don’t know what gases are exchanged? I thought the seal was perfect? (anyone know more about this?) Second, “cork” taint can still occur since TCA is naturally occurring. In fact, many wineries have acknowledged having TCA taint problems in the wineries themselves. Wine Spectator went so far as to name wineries such as Beaulieu Vineyard, E & J Gallo Winery and Chateau Montelena as culprits of winery-based TCA contamination. Guess who was to blame before the wineries were discovered as the problem? The cork companies, of course. So what does this all mean? Well, if you knew which producer used which cork, you the consumer might be in a better position. Right now, it’s a crap shoot and one that I’m now frustrated by. If given the choice between two wines with different closures, I might still grab the screw cap wine (if it is a young wines meant to be consumed early in life), but if I knew who the cork producer was that each winery used in their wines that choice might change. Gabriella is currently working on assembling an article on how a wine cork is produced and what has been done to eliminate TCA contamination in Amorims corks. For now, I just want you to know that there is a lot more to the story than just a piece of bark in the top of the bottle. For instance, a recent study* for the first time in the history of wine conclusively has shown that the cork does let in air. In fact, it appears that a lot of air is let in and out measurable within 6 months of bottling. This has always been one of the strongest arguments for using cork, the idea that a wine needed this “breathing” to evolve, but until now, there was no proof. This gives cork a big advantage over other closures. As Carlos puts it, a cork is an incredibly sophisticated valve. Before I go I want to point out one last thing. I know that I’ve only visited one producer of cork. I also know that we were given a polished version of the story. That aside, the evidence is incredibly persuasive. Also it was interesting to hear a “spokesperson” admit their problems and even to go so far as to point them out to us during our visit. Right now though, I would like to further examine the issue, maybe even visit another producer or two. *This study was funded by Amorim, something that they have no problem letting everyone know. It was done at Faculte d’Oenologie de Bordeaux, and when we have a copy of it in electronic form, we’ll amend this post to include a downloadable version. For now, a well done summary of the report can be found here. **One last note. I really want to hate cork, but after seeing how this resource is truly 100% renewable, I was floored by the fact that there is so much to love. If the industry can find a way to share technologies across the spectrum of producers to lower cork taint problems as low as the claim to be at Amorim, then I can find no reason not to embrace fully this ancient technology. Gabriella’s multi-part series will hopefully layout a lot of the stats, processes and reasons that Cork is a viable if not dare I say perfect closure for a wine bottle. Stay tuned. Oh and I still do like screw caps, and will continue to support their use in certain situations. There is definitely room in this world for more than one wine closure. ***Last point, I swear! What really was amazing and that we’ll try to show in our other articles, is that Cork is a 100% renewable resource. 100%. 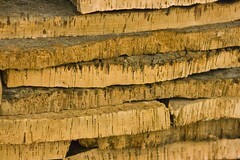 Just look at how the cork factories are fueled…by cork dust created in the production process! No waste. Slideshow of our Trip – Stay tuned for a video too!